Amazon Price: $19.95 $17.95 (as of March 15, 2019 9:48 am – Details). Product prices and availability are accurate as of the date/time indicated and are subject to change. Any price and availability information displayed on the Amazon site at the time of purchase will apply to the purchase of this product. The president of the US orders Director Elizabeth Harker of the Project to investigate the collision at sea of a US Navy missile destroyer with a Chinese freighter. It may have been sabotage, and the president wants her to get to the bottom of it. But the assignment is not what it seems. Harker has an enemy in the White House who wants her to fail. The Project’s continued existence is on the line. In the cold reaches of the far north, a hidden supercomputer with malicious artificial intelligence is being used by a secret organization to drive the world to war. Disruptive attacks across the world begin to create deep suspicions between China, Russia, and America. Preparations for war escalate. As the war drums begin to beat, the Project team discovers a digital trail that could lead to whoever is trying to touch off a nuclear confrontation. That makes the team a serious threat. They’re getting too close to the truth, and the man behind the attacks decides to stop them. As the doomsday clock ticks toward zero, it’s touch and go whether any of the team will get out alive, much less stop the certainty of nuclear war and mutual annihilation. Will they survive long enough to stop the missiles from flying? 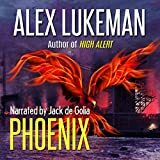 Alex Lukeman writes action/adventure thrillers featuring a covert intelligence unit called the PROJECT and is the author of the award-winning Amazon best seller, The Tesla Secret. Alex is a former Marine and psychotherapist and uses his experience of the military and human nature to inform his work. He likes riding old, fast motorcycles and playing guitar, usually not at the same time. You can email him at alex@alexlukeman.com. He loves hearing from readers and promises he will get back to you.